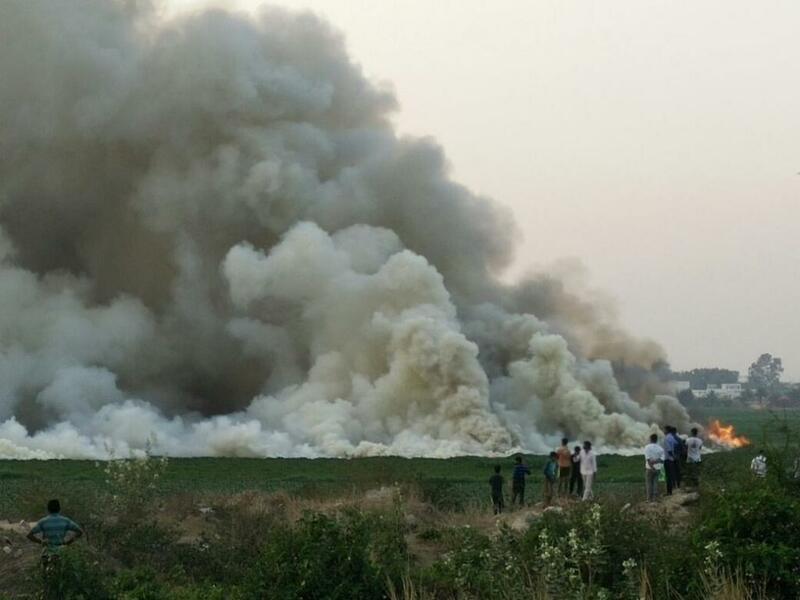 Bellandur, the largest lake in Bengaluru, caught fire on Thursday (February 16) evening after a garbage mound around it was set ablaze. Dry hyacinth and weed around the lake also caught fire, further intensifying the situation. The possibility of toxic chemicals, which are dumped into the lake, causing the fire to flare up cannot be ruled out. The environment ministry has already ordered a probe into the incident. In May 2015, the foam covering the water surface caught fire and burned for hours. While illegal dumping of garbage on the banks of the lake is a persistent issue, the locals allege that weeds and dry grass are also regularly burnt in the area without supervision by garbage collectors. The extent of the fire was such that it almost engulfed the entire lake. The smoke not only reached a nearby flyover, but also caused a scare among residents and motorists on the busy Sarjapur main road. The local authorities are in state of denial and blamed it on the dry grass in the vicinity. The locals have time and again approached the civic authority to stop the discharge of chemicals and other toxic substances from factories and households into the lake. 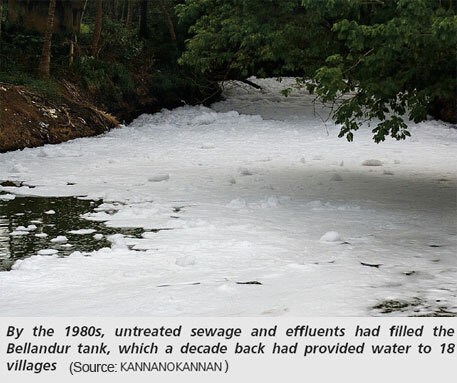 Pollution regularly causes the Bellandur Lake to froth so heavily that the foam is seen on nearby roads. Often, flames are seen leaping off the water because of the phosphorus and oil on the surface. Experts had often pointed out to a huge amount of sewage flows from Bellandur Lake to Varthur Lake due to the failure of Bangalore Water Supply and Sewerage Board (BWSSB) to manage the sewage of the city. Bellandur, along with Varthur—the other major lake in Bengaluru— has been ruined because of the constant dumping of untreated sewage and toxic chemicals from small factories. The BWSSB has certainly failed to divert sewage water. According to the Karnataka State Pollution Control Board Chairman Lakshman, notices have been issued to the BWSSB and other agencies to stop the dumping. He added that the board is in the process of inspecting sewage treatment plants in the area. In April 2016, activists from the Namma Bengaluru Foundation had submitted an action plan to Bengaluru Development and Town Planning Minister K J George to rejuvenate this 131-year-old water body. The government has accepted all the recommendations, including the short-term measures like de-weeding and improving aeration by installing a fountain. “I hope the government comes up with a plan for a time-bound implementation of the measures,” says Pabbisetty. The long-term measures, recommended by committee, included installation of sewage treatment plants (STPs) of 90 million litres per day (MLD) at Ammanikere, 60 MLD at Koramangala and Challaghatta valleys and 150 MLD to treat water from Koramangala and Ejipura drains. Sanchita Jha, a Bellandur resident and an IT professional, had started an online petition in 2015 urging government to take immediate action. More than 46,000 people have signed it so far to prevent what can be a carcinogenic disaster. Apart from de-weeding and installation of sewage treatment plants, the petition also demanded regular harvesting of macrophytes which helps in curtailing nutrients accumulation. It also called for installing online water quality monitors at the treated water outlets. Agara, Bellandur and Vathur lakes are connected to each other and the flow of one lake passes on to the other, says Shridhar Pabbisetty, chief executive officer of Namma Bengaluru Foundation, a Bengaluru-based non-profit. Pabbisetty explains that a huge amount of sewage flows from Bellandur lake to Varthur lake because of the failure of Bangalore Water Supply and Sewerage Board (BWSSB) to manage the sewage of the city. Vaman Acharya, chairperson of Karnataka State Pollution Control Board (KSPCB), also blames BWSSB for mismanagement of the sewage. He says oil continuously spills into the Bellandur lake from the garages and motor service centres along its banks. Methane gas produced from the heavy load of sewage is unable to escape into the atmosphere due to heavy accumulation of foam over the water body. In such a situation, any small trigger is enough to cause a fire, explains Acharya. Leo Saldanha, coordinator of Bengaluru-based non-profit Environment Support Group (ESG), explains that the main problem is the lack of a sewage management plan for the city. Acharya says around 600 million litres per day (MLD) of sewage is diverted to the sewage treatment plants near this three-lake system. Only 200-220 MLD sewage gets treated and the rest flows into the lake system. KSPCB says that the pollution in the lakes is only due to dumping of domestic sewage. There are 14 industries in the area around Bellandur lake. But the state pollution control board, which is in charge of monitoring the pollution of these industries, claims they are managing their waste and not dumping anything into the lake system. But BWSSB, which is in charge of managing domestic sewage, blames the industries for the pollution. KSPCB, which monitors the water quality of the lakes, says that the water in the lake is loaded with domestic sewage and that there is no stress of any heavy metals on the lake’s water. The water quality of the lakes is not even suitable for outdoor bathing. The Biological Oxygen Demand of the lake is much higher than the standard value set by Central Pollution Control Board for outdoor bathing (3 mg/l). A report by KSPCB shows that the Bellandur lake had consistently high Biological Oxygen Demand (BOD) during the dry period (January-February) between January 2013 and January 2015. It never went below 7mg/l during this period. There were also traces of total colliform in the lake’s water. Bengaluru’s lakes are facing the dual threat of pollution and encroachment. Bellandur, a 130-year-old water body, is part of the Bellandur drainage system that drains the southern and the southeastern parts of the city. Water from this tank flows further east to the Varthur tank, from where it goes down the plateau and eventually into the Pinakani river basin. In the 1970s, people from 18 villages depended on the waters of this tank. But by the 1980s, the chain of tanks feeding Bellandur had broken up. Rainwater did not recharge the tank. Instead, untreated sewage and effluents flowed into the water body. In 1997, fisher folk groups from Yemlur, Kempapura and other places filed a petition against the then chief minister of the state as the polluted tank was affecting the fish yield. The petition was passed on to the fisheries department, which released fishlings into the tank to increase their production. But the fishlings did not survive. In 1999, the Karnataka High Court ordered BWSSB to supply potable water to residents in Bellandur and to ensure treatment of sewage. But nothing changed. A contempt petition was filed. The case is pending before the Lok Adalat. Recently, there was a huge protest by village residents to make the lake encroachment-free. T V Ramachandra of Centre for Ecological Sciences at the Indian Institute of Sciences, Bangalore, says that Bellandur also faces the threat of an upcoming SEZ. When the project becomes operational, it will not only encroach upon the lake bed but also increase the threat of flooding in the area. A break in the connection between the lakes will lead to the loss of Rajakaluve (storm water drains) and, hence, it will not be possible to manage the overflow of the lakes. 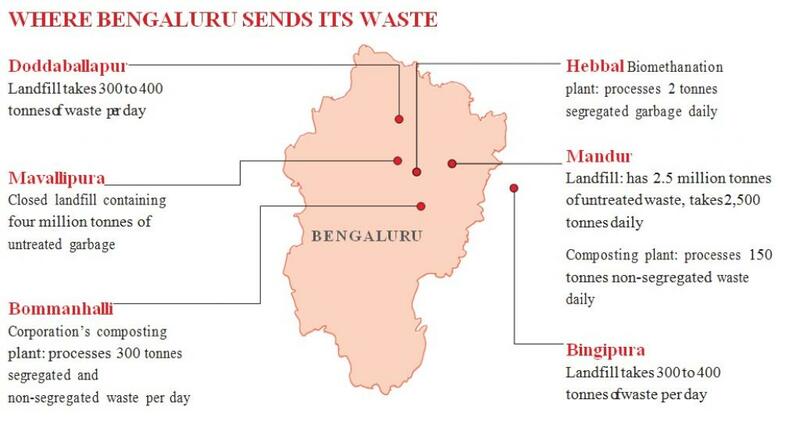 Bengaluru’s efforts at managing waste are not adding up to much. Its dream to turn into a spanking clean metropolis has gone awry. The incident of Bellandur Lake catching fire is a consequence of a problem that hasn’t been addressed for far too long. In October 2012, the crisis forced an exasperated Karnataka High Court to take a dynamic stand on waste management and make segregation of wet and dry waste at the source mandatory. The order, first of its kind in the country, was inked into law after both Houses of the state legislature approved it. 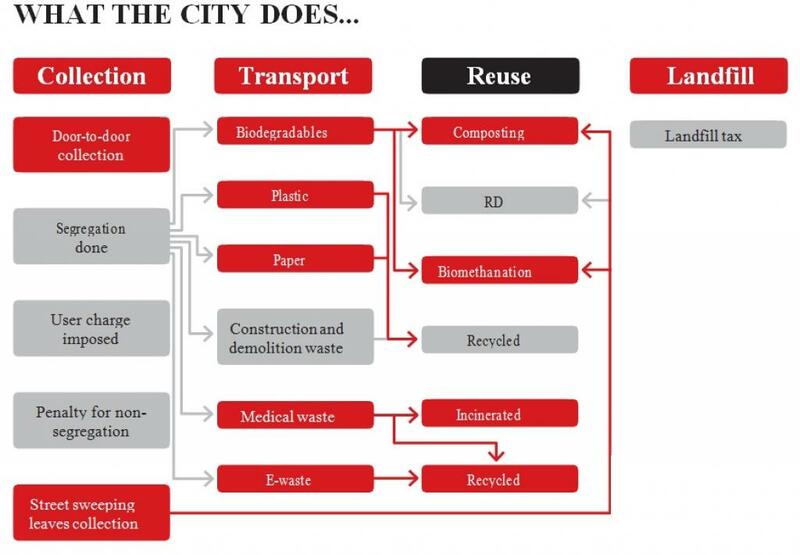 The city framed solid waste management (SWM) guidelines that could help other cities as well. In another first, waste was classified into six categories, generators of bulk waste were instructed to manage their own garbage, and a system of imposing penalty was established for garbage-related offences. The city invested heavily in infrastructure facilities like dry waste collection and segregation centres, biomethanation plants, besides enhancing composting capacity. It appeared Bengaluru had learned how to handle its waste. Today, however, a stroll around the city shows that these measures have not made the 800-sq km information technology hub any better in managing its solid waste. Bengaluru generates 4,000 tonnes of garbage every day and spends Rs 450 crore per year on garbage management. Of this, Rs 150 crore goes just on transporting waste to landfills. Estimates, however, indicate that not more than 30 per cent of the waste is segregated. Worse, waste segregated at source is still being mixed on way to landfills. At present, only 100–120 tonnes of segregated waste goes to the Karnataka Compost Development Corporation’s (KCDC) Bomanhalli composting yard in a day. The officials at Bruhat Bengaluru Mahanagara Palike (BBMP), however, assure that remedial measures are in the pipeline. The corporation has identified 22 wards for a pilot effort in segregation. With time, this will be extended to all wards. To tackle the problem of segregated waste getting mixed in transit, a demand has been placed for at least one truck per ward per day dedicated to wet waste. “Waste segregation in some wards, identified for the pilot, is as high as 80 per cent. If the demand for trucks is met, the quantum of waste that goes to the landfill will reduce significantly,” says a BBMP officer. The BBMP has procured 16 biomethanation units, which can convert five tonnes of kitchen waste into biogas every day. It paid a whopping Rs 1.2 crore for each unit, which includes a generator to convert biogas into electricity and three years of maintenance charges. The capacity of KCDC’s Bomanhalli composting yard is being enhanced to 600 tonnes per day, twice its current capacity. An additional outlay of Rs 50 crore has been made for land and infrastructure for decentralised processing units for wet waste. But till the time this story was written, of the 16 bio-methanation units, only one had been commissioned. It receives less than two tonnes of segregated waste. In July, 2012, the then Karnataka State Pollution Control Board (KSPCB) chairperson A S Sadashivaiah had ordered closure of Mavallipura landfill because of non-compliance with norms by its operator M/s Ramky and absence of authorisation as per the MSW Rules, 2000. KSPCB had also ordered Ramky to scientifically process the four million tonnes of waste accumulated in the landfill within three months. Acting against KSPCB’s order, on August 23, BBMP deployed 600 police personnel to open the dump amid bitter protests. Later, Vaman N Acharya, given charge as KSPCB chairperson, withdrew the closure order at the behest of then Chief Minister Jagdeesh Shettar. Responding to a public interest petition, the Karnataka High Court ordered closure of the landfill and instructed the BBMP to immediately implement segregation at source and penalise any non-compliance. Residents of Mavallipura and 12 other villages close-by have vowed not to allow any more garbage to be dumped in the landfill. On November 6, the court rapped BBMP for allowing a dump to come up at Mavallipura, also blaming it for 11 bird hits at the Yellahanka air base. Following the Mavallipura incident, citizens groups closed the Mandur and Dodaballapur landfills as well. After hectic negotiations and assurances from city administrators, Mandur residents allowed BBMP to dump non-segregated waste till October 1. This was extended for another three months by promising the residents that organic sprays would be used to reduce stench and flies, and stagnant leachate in the nullahs would be sucked out. The BBMP officials refused to comment when asked why Ramky and other errant operators were not penalised. One BBMP official said, “If we penalise anyone now, the entire system will collapse”. However, people and non-profits narrate a different story. According to Leo Saldanha of non-profit Environment Support Group, BBMP illegally dumps garbage at several disused quarries. The toxicity created garbage in the landfills has contaminated groundwater, impacted agricultural produce, given rise to unknown diseases and even caused deaths in the 15 to 20 villages that surround each dump. Also, four months after KSPCB first ordered closure of Mavallipura landfill, there is still no collection system in place for segregated waste. Segregated and non-segregated waste is taken to the landfills in the same truck. Bengaluru’s garbage time bomb is ticking away. Every day, 2,500 tonnes of waste is dumped at the Mandur landfill, the biggest after Mavallipura. Several smaller landfills receive 300 to 400 tonnes each per day. In December 2013, the High Court had ordered permanent closure of the overflowing Mavallipura landfill. Yet, a colossal 4 million tonnes of waste lies untreated. In Mandur, 2.5 million tonnes of waste lies untreated. Mandur, too, may get filled to the brim soon. People who live close to the landfill are seething. With all legal and financial provisions in place and people aware and willing to cooperate, the BBMP has only its own lethargy to blame for the garbage mess.